Up to six percent of red dwarf stars have habitable, Earth-sized planets. Red dwarfs are the most common stars in our galaxy, so that means the closest Earth-like planet could be just 13 light-years away. Red dwarf stars are smaller, cooler, and fainter than our Sun. An average red dwarf is only one-third as large and one-thousandth as bright as the Sun. From Earth, no red dwarf is visible to the naked eye but we are surrounded by a swarm of red dwarf stars. About 75 percent of the closest stars are red dwarfs, and so, since 6 percent of those should host habitable planets, they arrived at 13 light years as the closest Earth-like planet. 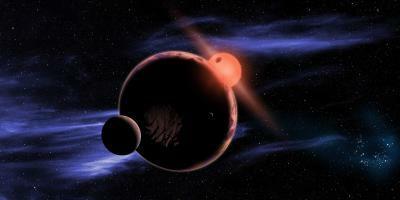 Despite their dimness, red dwarf stars are good places to look for Earth-like planets. Red dwarfs make up three out of every four stars in our galaxy for a total of at least 75 billion. The signal of a transiting planet is larger since the star itself is smaller, so an Earth-sized world blocks more of the star's disk. And since a planet has to orbit a cool star closer in order to be in the habitable zone, it's more likely to transit from our point of view. The astronomers examined culled the Kepler space telescope catalog of 158,000 target stars to identify all the red dwarfs. They then reanalyzed those stars to calculate more accurate sizes and temperatures. They found that almost all of those stars were smaller and cooler than previously thought. Since the size of a transiting planet is determined relative to the star size, based on how much of the star's disk the planet covers, shrinking the star shrinks the planet. And a cooler star will have a tighter habitable zone. Harvard astronomer and lead author Courtney Dressing (CfA) says they identified 95 planetary candidates orbiting red dwarf stars. This implied that at least 60 percent of such stars have planets smaller than Neptune. However, most weren't quite the right size or temperature to be considered truly Earth-like. Three planetary candidates were both warm and approximately Earth-sized. Statistically, this means that six percent of all red dwarf stars should have an Earth-like planet. "We now know the rate of occurrence of habitable planets around the most common stars in our galaxy," said co-author David Charbonneau (CfA). "That rate implies that it will be significantly easier to search for life beyond the solar system than we previously thought." Locating nearby, Earth-like worlds may require a dedicated small space telescope, or a large network of ground-based telescopes. Follow-up studies with instruments like the Giant Magellan Telescope and James Webb Space Telescope could tell us whether any warm, transiting planets have an atmosphere and further probe its chemistry. Such a world would be different from our own. Orbiting so close to its star, the planet would probably be tidally locked. However, that doesn't prohibit life since a reasonably thick atmosphere or deep ocean could transport heat around the planet. And while young red dwarf stars emit strong flares of ultraviolet light, an atmosphere could protect life on the planet's surface. In fact, such stresses could help life to evolve. 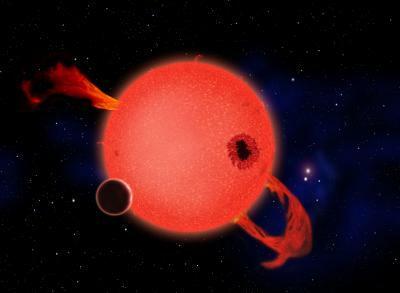 Since red dwarf stars live much longer than Sun-like stars, this discovery raises the interesting possibility that life on such a planet would be much older and more evolved than life on Earth. "We might find an Earth that's 10 billion years old," speculated Charbonneau. Dressing presented the findings today in a press conference at the Harvard-Smithsonian Center for Astrophysics in Cambridge, Mass.